As an appetizer or main event, these Oven Baked Ribs with Bar B Barn Sauce are guaranteed to be a crowd-pleaser. Sweet and sticky, perfect fall-off-the-bone tender ribs every single time! Growing up Italian meant a lot of home cooked meals. So naturally, the first time I ate in a restaurant made a lasting impression on me. It was the Bar-B-Barn Restaurant located in my hometown, Montreal. It’s been opened ever since 1967 and has since become somewhat of a city landmark. Fast forward a few decades later…I am preparing ribs, at home with a copycat version of the recipe for the BBQ sauce. I love to serve these ribs with Baked Beans and Sweet Corn Salad. They also make one of the best appetizers… just make sure to provide your guests with some hand wipes! Are you ready to make the best ribs? Before I begin, I know that I am opening up Pandora’s box by writing that I boil my ribs before cooking or barbecuing them. Yes, I am wearing my dietitian‘s hat as I am writing this. I have had my share of discussions with so many friends and family over the years. 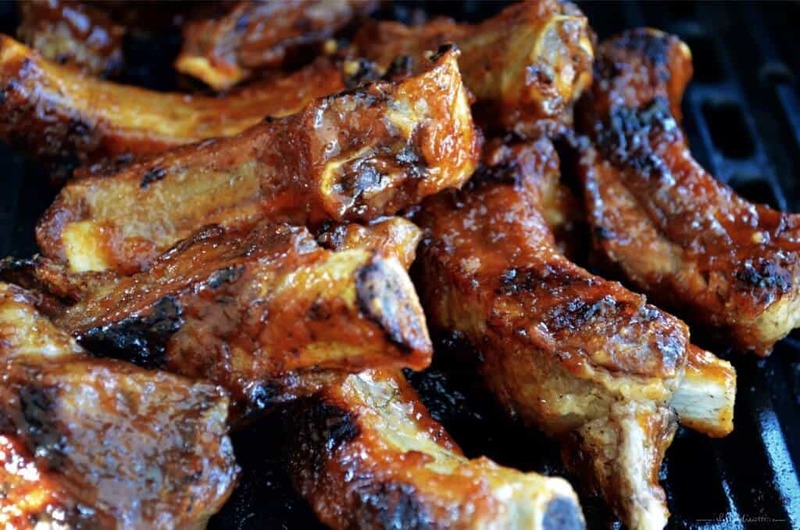 I am always interested in knowing how everyone prepares their ribs, and particularly what motivates people to boil or not boil their ribs prior to baking or barbecuing with the sauce. I have come to the conclusion that it really boils down to personal choice and taste (please excuse the pun, but I couldn’t resist!) Based on my personal experience, every time I serve these ribs, I have yet to hear someone complain about the taste. Boiling the ribs: Let‘s begin by placing the ribs in a large pot. Cover with cold water and add a few bay leafs, one onion, one celery stalk and a few peppercorns. Bring to a boil; cover and then reduce heat to a simmer. Let it go for about 45- 60 minutes. In the meanwhile, let‘s make the sauce. To make the sauce: Simply combine all the ingredients in a medium sized pan over medium heat. These ingredients include: brown sugar, applesauce, ketchup, lemon juice, salt, pepper, cinnamon, paprika and garlic. Simmer for about 20-30 minutes. Once done, set it aside while waiting for the ribs. 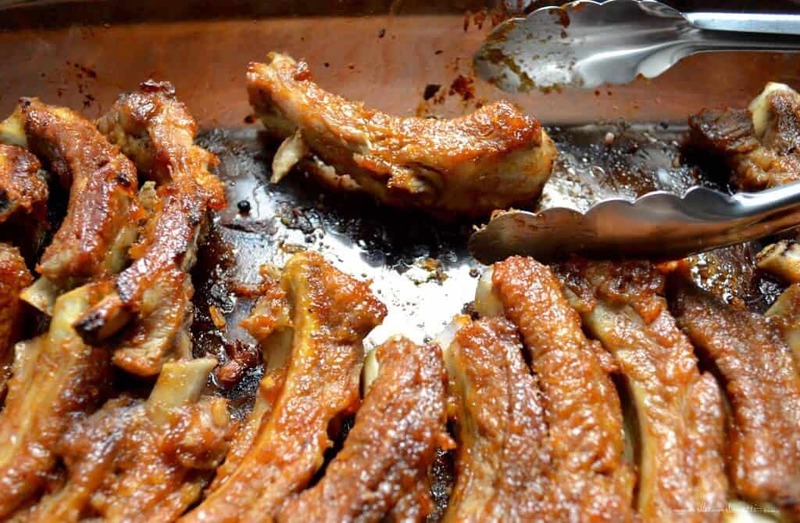 Baking the ribs: Place the boiled ribs in a single layer in a large baking dish. Brush the sauce on one side of the ribs and bake for about 45 minutes. Turn the ribs over and baste with more sauce and cook for another 45 minutes. Decades ago, my cousin Mary, who loves the local newspaper, the Montreal Gazette, informed me that the recipe for the infamous Bar B Barn rib sauce was featured in the Food Section. That was a very happy day for me. I found the original recipe for the sauce to be a little too sweet, so I decreased the amount of brown sugar. (My husband still finds it a little sweet, but he is in the minority). I kept all the other measurements the same. I will also use my Homemade Applesauce for this recipe. Feel free to use any commercial brand that is unsweetened. So, whether or not you boil your ribs before cooking them, you really should try this Bar-B-Barn sauce for ribs. Restaurant style ribs in the comfort of your home. 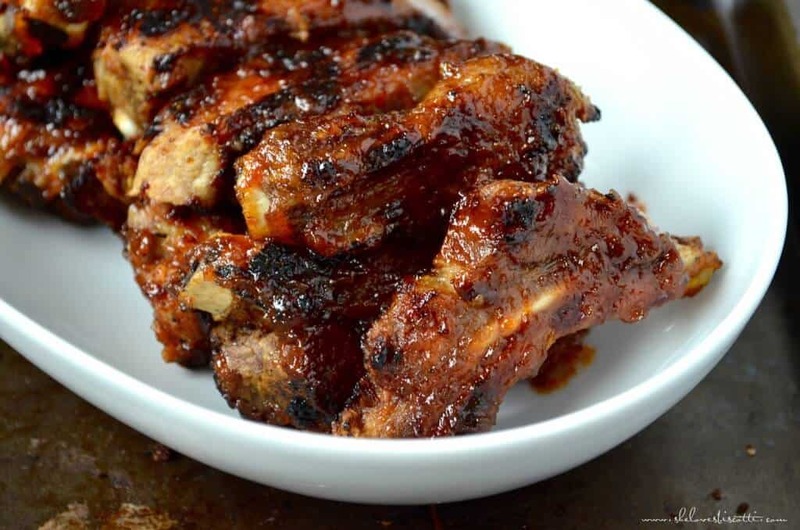 ★★★★★ If you have made these Oven Baked Ribs, I would love to hear about it in the comments below and be sure to rate the recipe! As an appetizer or main event, or whether baking, barbecuing or slow cooking, these Sweet Bar-B-Barn Ribs are guaranteed to be a crowd-pleaser. Enjoy! Place the ribs in a large pot. Bring water to a boil; cover, reduce heat and simmer 45 minutes to 1 hour or until ribs are tender (meanwhile you can make the sauce). Remove ribs from pot and place in a shallow glass baking dish. While the ribs are simmering, whisk all the ingredients for the sauce in a medium sized pan over low heat. Simmer for 20-30 minutes, occasionally whisking the sauce. Brush sauce on one side of the ribs. Turn ribs over and baste with more sauce. Continue cooking for another 45 minutes. I will use my homemade chunky applesauce for this recipe. If barbecuing, place ribs on greased grill on medium heat. Baste with sauce. Continue turning and basting for about 15 minutes or until meat is nicely grilled and sauce is caramelized. DO YOU LOVE THIS RIB RECIPE? PIN IT TO YOUR MAIN MEAL BOARD! Maria I love this recipe. 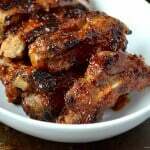 When we are in the mood for great sweet ribs these are what I make. I also have a few recipes for bbq sauce that I through together. But none the less these go over very well. We have Rib fest in our town and never bother instead I make about 3 different kinds one of source is this one then invite a bunch of friends over . They always said did you get these at rib fest and I say nope these are bar b barn sauce and mine. Nobody goes home hungry. Thanks a million!!! Thanks so much on a cool Halloween 🎃👻night .. this recipe is being shared on F bk by a group slightly homesick (read BAR B line ups!) ex Mtlers from Toronto to Calgary to D C to Pennsylvania…as it s been tested now..! I m hoping Calgary young uns will use at Christmas…but also a) the Tuscan bean soup is in the slow cooker and I loved your potsticker cooking hints..! Now if only those bricks of fries..could be bought like putt putt St H pies and tourtieres in Calgary..! Thanks for these.! My pleasure Wendy! Hope they brought back some wonderful memories ♥ Thanks for taking the time to comment. Hope you guys had a great Halloween! Made the ribs for a family get together, and we loved them! Oh Maria, I could not believe you did this. I was studying in McGill in the 80s and had waited in line so many times for those famous ribs. I have since been trying to come up with a similar version. Over the years, I experimented and modified, Eventually, I become very good with ribs and have about 5-6 versions . Had 3 major breakthrough over the years and my sweet ribs are slightly different than Bar B Barns. I visited them again a few years back and my family prefers mine now. However, I will try this recipe here and will keep an eye on your blog. I sometimes boil my ribs but not always, most definitely when I prepare Asian flavored ones, cause the boiling creates a very flavorful broth (after the fat is remove) for quick soups. I do love ribs! I have my own favourite recipe but I’m always looking at new recipes too and have never tried one with applesauce in! These ribs look and sound great. Gotta try to make your sauce Mary! !